See map Blue Mountains Map NSW - Weather. An hour’s drive or train ride from Sydney Central, offer spectacular views and great walks in the bush. As well as a lot more, with cosmopolitan restaurants, accommodation to suit any budget, Australian history and outdoor adventure. The name derives from the ever present bluish haze evaporating from the millions of eucalyptus trees dominating the Sydney Blue Mountains. Wildlife and especially birdlife is abundant here, yet only a short trip from Sydney. The region has dramatic scenery of mountains, spectacular cliffs and escarpments of sandstone, limestone and lava rock. Covered by millions of gumtrees, these mountains harbour abundant native wildlife including colourful birdlife. When the colony of NSW was first founded, it took some 25 years before a route across the Blue Mountains was discovered by the Europeans in 1813. Needless to say, the local Aboriginals, the Gundungarra, Wiradjuri and Dharug tribes, had been traversing the mountains for thousands of years. Three explorers, Blaxland, Wentworth and Lawson got advice from the Aboriginals to stick to the ridges. They found their way to the rich fertile hinterlands and into a permanent place in Australian history. William Cox built the first road across in 1814 and since then, the mountains have been a popular Sydney destination. There are three towns named after the early explorers, named appropriately, uh, Blaxland, Wentworth and Lawson. You can find amongst the many villages and towns dotting the Blue Mountains, art galleries filled with works from local artists, historic houses and hotels, marvellous gardens with comfy coffee houses and eateries offering winter warmth in winter. The Mountains offer a cool Sydney escape in the warm summer months. Try the Devonshire Teas with the homemade scones with cream and homemade jams. Blue Mountains Walkabout tours offer a chance for you to experience the local aboriginal culture, education and adventure for yourself. There are numerous bus tours available from the city, particularly at Circular Quay, between the Sydney Opera House and The Rocks. Since the opening of the pioneer trail by William Cox in 1815, exploring has been a lot easier. There are many historic inns and pubs, grand hotels and resorts dating from the 1800’s. There are also caravan parks to modern luxury resort accommodation available at Leura and Katoomba. They offer a variety of experiences and budgets for those wishing to stay longer than a day visit. Bed and Breakfasts, B&B’s are another popular way to enjoy a stay in the Blue Mountains. 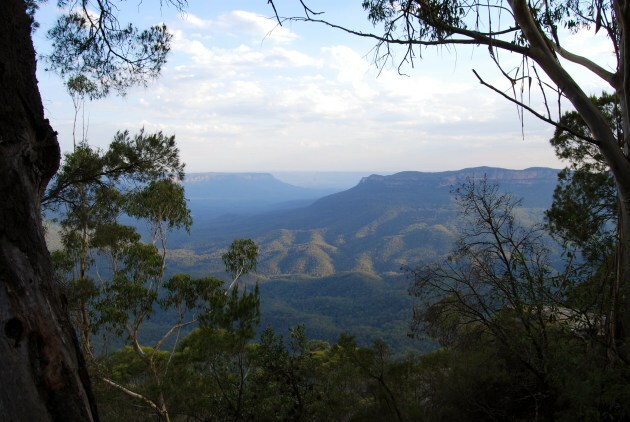 Places to visit in the mountains: Blue Mountains NSW with Map. The fresh mountain air and views can make food taste better! There are plenty of eateries and restaurants dotting the mountains to accomodate even the most discerning palate, with sumpteous traditional fare, as well as almost every cuisine from Australian, Italian and French, to Thai. West of the Blue Mountains are the vast and fertile plains of Central NSW with its many historical gold mining, sheep, cattle and farm towns, including Dubbo and Bathurst. 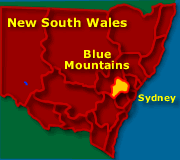 See Map of the Blue Mountains NSW. 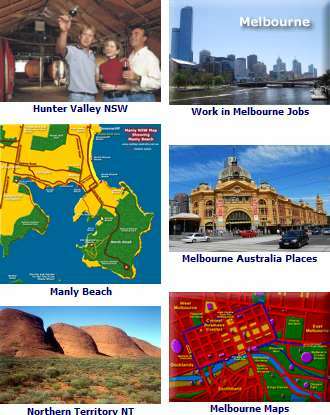 See Greater Sydney Map - Sydney Attractions. Sydney accommodation - Hotels in Sydney. For more Sydney and Early Australia history see Sydney History. Finding Sydney work Sydney Work - Jobs or Study in Sydney and Australia. Find Hotels in Blue Mountains Australia Accommodation Blue Mountains.